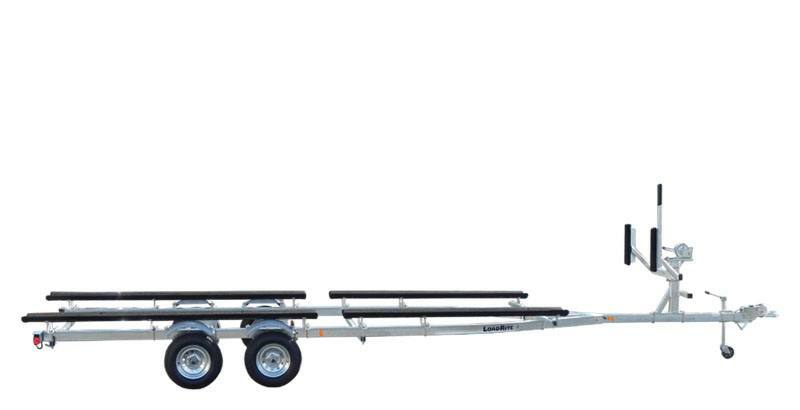 2019 Load Rite P-Series Pontoon (P-22/24T-3000T) 28 ft. 7 in. DISC BRAKES (WHERE INSTALLED): This trailer is equipped with disc brakes (where installed). Load Rite recommends disc brakes on all wheels where available. Disc brakes are self-adjusting and self-cleaning and require minimal maintenance in order to continue to deliver top performance. Follow maintenance tips in your Owners Manual for more detailed instructions. GALVANIZED STEEL FRAME: Tubular structural steel, fully hot dip galvanized, provides the ultimate finish for any boat trailer. Tubular design shrouds wiring and brake lines from damage. All machining and welding is performed before galvanizing, so there are no surfaces left unprotected from a boat trailer's ultimate enemy: corrosion. PONTOON STANDARD WINCH STAND: Standard pontoon winchstand for all models with capacity greater than 16' 5". Assembly includes two integrated steps with non-slip surface and a handrail. Includes two carpeted bunks to protect the pontoon deck. BIAS-PLY TIRES: High quality USDOT-rated tires. Standard on all 5 STARR, pontoon, skiff and jon models, and models 90" wide and narrower. Easily upgraded to radial tires at time of order. NMMA / NATM CERTIFIED: Each year Load Rite trailers undergo a detailed inspection process in order to earn the right to proudly display this certification on products we manufacture. GREASEABLE HUBS: Trailer with peace of mind knowing that you've inspected the condition and topped off the lubricant level in each hub of your trailer. CARPETED WOOD BUNKS: Marine-grade carpeted wood bunks provide excellent support without marring the hull during loading and unloading. WINCH: A winch is standard equipment on all boat and PWC models. Capacity and features vary by application. DOT RATED TIRES AND LIGHTING: All Load Rite original equipment tires and lighting components are fully DOT approved. EP PONTOON WINCHSTAND: Standard winchstand on models with 16' 5" maximum length capacity or smaller. HEAT-SHRUNK SEALED, CONCEALED WIRING: Standard equipment on all trailers 17' and longer except welded frame models. PONTOON TONGUE JACK: Standard on all models with maximum fit capacity greater than 16' 5". PLASTIC FENDERS: Impact-resistant plastic fenders. PONTOON TORSION AXLE: All except triaxle models. P-Series Pontoon (P-22/24T-3000T) 28 ft. 7 in.